After MaRo – Why Can’t We All Just Get Along? I love the fact that R&D is pushing the Race/Class model. 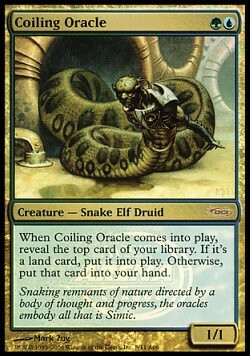 Quick aside: If you don’t know what the Race/Class model is, pick up a creature card, let’s say um, Coiling Oracle. Let’s take a look at it (Hint: it’s to the right). For the card type line we see: Creature – Snake Elf Druid. That creature is all of those types (A snake, an elf, and a druid) for every card that cares about creature types. Elvish Harbinger can search him up, can trigger Sosuke’s Summons, and can tap to Seton, Kroasn Protector. Its race (what the creature actually is) is a snake and an elf, and its class (what’s its role in its society is) is a druid. While not every creature has a class, every creature has a race (except Nameless Race, which was updated with the first creature type clean up). But remember, everything on the card type line is the creature type. Remember to check Gatherer for updates to old cards (Creature type update 1, update 2). Why is this a good thing? Why do we need the Race/Class model in Magic? In the beginning there was “Summon X” and all was good. But over the past 15 years, Wizards have changed it, and some people think that it loses some flavor when it looks a little more structured. Sure, it’s much cleaner for rules, but it lost it’s fantasy flavor. But this is where it can make up with the fantasy fans. I’m not into D&D or WoW (don’t shoot me, I’ve got my one addiction), but I know that those fantasy games have the same race/class markup. Wizards pushed this so they could fit more with those fantasy games, something that Magic didn’t have at the beginning of the game. It added the flavor back into the game, which I love, as long as it doesn’t ruin mechanics (sorry, I’m more of a game interaction than flavor fan). But with those cards that used to read, “Zombies gain X” you can now do stuff like, “Non-Zombie Clerics gain X” if you want to create those type of cards. Sometimes, it’s better to help/hinder the class than the race (like Boldwyr Intimidator does), but that opens so much more design space. There can be a beast creature that has protection from Wizards, or equipment that can only be equipped by warriors (not the new battle axe). Again, the designs have opened up to alot more options then previously had. Since this is the first set that deals with class, this was the first time that alot of people had thought of it since it was put into place at the beginning of Mirrodin. But, there’s a problem that Wizards needs to figure out. Every one of the colors has a common iconic race (Green – Elf, Red – Goblin, Black – Zombie, Blue – Merfolk), except White. They have Soldiers, which is a class. When base sets are made, the idea is to push for Soldiers instead of any race. This is why this “new” race of Kithkin were pushed for Lorwyn, they really didn’t have a commonish race. At the moment, they are the iconic race, but we (the players) don’t know if it will just stay on the plane of Lorwyn or travel to the next one with us. Will Wizards stay with Kithkin as the main race or will Wizards not have one for White, which might not be a bad idea. How can a color not have a main race? White is all about togetherness, working together for the common goal (read my color pie identity project) so what better way to display this then to push class rather then race? Sure, there’s going to be problems that which class to push in White (Soldiers, Clerics, etc) but that’s not my call. In reality, it depends on the flavor of the world that Magic is traveling to. As well as the base set when “Lord” cards are more common, what will be the White “Lord”? It might not that bad of an idea for White to back class, as then it will make the identity of the color more solid and it will bring some focus to the class type on a creature (as before Morningtide, it was really more then an afterthought). If White has class “Lords” then there could be an open field of design that White hasn’t had a chance to touch that much: anti-class direct damage, bounce or counters (all that White has seen but in limited numbers). There can be the constant change in creature types (Wizards has said they won’t print a Human “Lord”, but this is a great way around that). Once they answer this question of how they will go forward, then we proceed with our own sets with the creature types. We can offer suggestions and ideas, but we aren’t the ones that create the game, Wizards is. If you haven’t written MaRo before about anything, I suggest you do this. Tell him your thoughts, and I would love to hear what you think. Should White be more focused on class rather then race? I think it’s an interesting idea, but who knows. If you haven’t voted in Super Tuesday, please do. I’m in a state that doesn’t vote today, so vote. It’s important. But yes, race/class is Good. Although you’ve missed that Zombie isn’t a race at all, but a Status. You can see this if you look at cards like Dross Crocodile (type: Zombie Crocodile), Accursed Centaur (type: Zombie Centaur), or Festering Goblin (type: Zombie Goblin), versus “human” zombies like Scathe Zombies (type: Zombie – and not Zombie Human as it should be). Personally, I think it’s a bit of an odd proposal to say that one colour should be more class-focused while others are race-focused, but… it does seem to fit with white’s historical approach. Interesting suggestion.